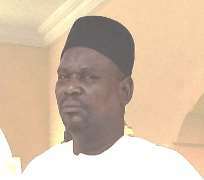 A senior legal practitioner in Borno, Ahmed Mai-aji, was yesterday sentenced to seven years imprisonment by the state High Court sitting in Maiduguri. Aji was convicted of criminal breach of trust and cheating of his client to the tune of 3 million Naira by Justice Haruna Yusuf Mshelia, the presiding judge of the Borno State High Court, Maiduguri. This was contained in statement by the Economic and Financial Crimes Commission, EFCC, on its official Facebook handle. The Commission said that 'the accused person who is a senior lawyer entrusted with a land document for the purpose of intervening in a land dispute between the complainant and another party, dishonestly disposesed the plot in violation of the trust the complainant have for the accused. 'It will be recalled, Mai-aji was re-arraigned as a result of an application brought by his counsel, S.M Konto seeking an order declining jurisdiction to hear and determine the charge on the ground of bias or likelihood of bias by Justice Fadawu Umar. '“The Registrar of the court should return the case file to the Chief Judge of the State and I hereby decline jurisdiction not to hear the case. The accused be further remanded in the prison custody”. 'On Tuesday June 13, 2017, Mai-aji was re-arraigned by the EFCC before justice Mshelia. Prosecution counsel, Khalid Sanusi in proving the case, tendered seven different exhibits and five witnesses testified against the convict. 'In his judgment, Justice Mshelia stated, “the court hereby found you guilty of the offences of criminal breach of trust and cheating”. '“That you, AHMED MAI AJI, sometime in 2016 at Maiduguri Borno State within the jurisdiction of this Honourable Court, dishonestly induced one Baba Yusuf Bukar to deliver to you the sum of N3,000,000.00 (Three Million Naira) only, in the name of payment for a plot of land situated at Pompamari Light Industrial Layout, Maiduguri Borno State, covered by grant of Right of occupancy N0:BO/6057 of 79.1981, which was kept in your custody for the purpose of discharging your responsibility without any right to sell same, contrary to and punishable under sections 320 and 321 of penal Code Law Cap 102, Laws of the Borno State of Nigeria 1994 respectively”. 'He was sentenced to five years in prison without an option of fine in count one. 'The convict was however found not guilty and therefore, discharged and acquainted on count two.